Innovation and entrepreneurialism are regularly talked about as being solutions to drive growth. However, my belief is that workplace training is also a vital and often overlooked part of the solution to the problem of stimulating growth in Europe. Workplace training shouldn’t be a ‘nice to do.’ It has to be a ‘must do.’ That’s because entrepreneurialism can only deliver sustainable new growth and employment if there is a ready supply of well-trained and motivated staff to fill new positions. With government education and training budgets being cut across the continent, there is a danger that the workforce is not learning the skills that will help the economy grow. Taking a step back, the fact is that for a company such as McDonald’s, the needs of our business and the needs of our employees go hand in hand. The business needs cohesive and dynamic teams, while employees value the sense of belonging this can provide. We need a flexible workforce, and our staff value flexibility in fitting work around their family lives. Most importantly, McDonald’s needs well-trained staff to deliver a great customer experience and our training initiatives therefore ensure we have a confident and competent workforce. In Europe, 31 out of our 40 market training programmes offer nationally-recognised qualifications. This ensures the skills staff learn with us are transferable, and they can use us as a valuable stepping stone in their careers. This benefits McDonald’s as employees value the opportunity to improve their employability and are consequently better motivated and more productive, but also other businesses and the wider economy. This emphasis on training doesn’t have to be the preserve of big companies only. Technology means it is within reach of many modern employers – whatever their size. High-quality training platforms allow employers to reach tens or hundreds of thousands of employees and instantly update teaching packages at minimal cost. It has also made training much more engaging. As an example of this, McDonald’s UK is implementing a new checkout system and to support the rollout, they have developed a video game where employees have to process a series of customer orders, scoring points for speed and accuracy. 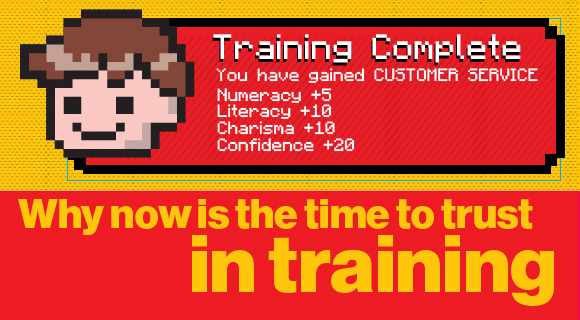 This kind of ‘gamification’ means people from across the company are now competing to achieve the highest scores and effectively volunteering to undertake training. The payback for business is clear – our research shows that digitally engaged staff scored customer satisfaction ratings that were significantly higher on average than less digitally engaged peers. Employers can and should do more to share these platforms publicly. The onus is therefore on employers to kick start training, but governments have a role to play too. The foundation stone of many of McDonald’s training initiatives has been the partnerships we have forged with the education sector, but policymakers have long considered employers and educators in isolation. At a time when government money is in short supply, European authorities should empower employers and the education sector to work together to deliver training for workforces in the most effective way. That means enhancing the reputation of vocational qualifications and facilitating partnerships between educators and businesses. By focusing on worker employability as a necessary first step on the way to full employment, policymakers can effectively future-fit the Eurozone economy to capitalise on any upswing in the global economy. The Green Deal is an ideal area where the government can point the unemployed to become part of the Energy Efficiency Revolution. There are training loans available for those who are unemployed as well as other support. McDonalds has for a long time been well regarded for its training program, especially for managment and the example given above shows how a large corporation can improve its service by way of innovative training. Far too often training is thought of as a paper chasing exercise. Basically paying money to have recognised awards which sometimes aren't all they are cracked up to be. It is time for employers to look more at how they can improve their own products and services by way of innovative training without spending many £'s on box ticking, usually boring, external training courses and schemes. It can be a two way thing and input from the staff at grass roots can help to improve the companies own processes and procedures. Our company employs experienced staff, but we still adopt regular training to ensure our that our standards remain consitent. Training doesn't necessarily mean a few days in a classroom looking at Powerpoint slides! The approach David is talking about here is refreshing - Ken Robinson captures a similar sentiment when he talks about the need to leverage technology to have learning that is tailor to the individual whilst being scaled. Clearly gamification has captured the imagination of these employees and engaged them in thinking about day to day business on another level. I would also add to David's discussion by saying that innovation & entreprenuerialism (boy I need a big tick for spelling that!) are synonymous with learning. There are two points here - firstly communities of practice and environments where new theories based on pragmatism are being generated will inevitably lead to innovation. Secondly the nature of being young (and I am thinking apprenticeships here) means taking personal risks, being a digital native and seeing the world through opportunistic eyes. There are also apprenticeships in Enterprise Skills in Business which drive this kind of learning, unfortunately employers are not taking up the more creative apprenticeship frameworks such as this as readily as business admin and customer services.